An important new report from the RILEM Technical Committee 119. This book presents models and methods to determine thermal stresses and cracking risks in concrete. 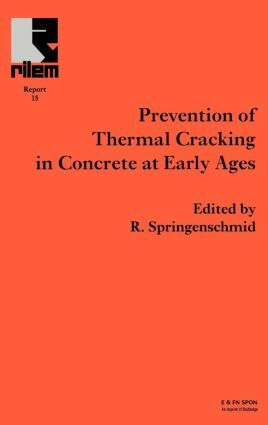 The possible influences on and causes of thermal cracking of concrete are discussed and cases of practical measures for avoiding cracking are detailed. Methods to determine the heat of hydration of concrete - P Morabito. Methods to determine thermal stresses and crack sensitivity in the laboratory - M Mangold. Influence of concrete constituents, mix proportions and temperature on crack sensitivity of concrete - R Springenschmid and R Breitenbucher. Temperature development in situ - K van Breugel. Development of mechanical behaviour at early ages including mathematical models - M Emborg. Restraining conditions - F S Rostasy and T Tanabe. Models and methods for computation of thermal stresses and cracking risks - M Emborg. Measurement of thermal stresses in situ - T Tanabe. Practical measures for avoidance of cracking, case records - S Bernander.